As a city in the United States, Newark is over three centuries old. Before Newark was occupied and built up by English settlers, the Lunaape (Lenape) people lived there. The Nanticoke Lenni-Lenape Indians of New Jersey are based in southern NJ; the Ramapough Lenape Indian Nation in the north (around Mahwah, NJ). Lunaape people also are now in Oklahoma. Since I am documenting some of what I know about the context of several twentieth-century buildings in Newark by the architect Cass Gilbert (1859-1934), I will not focus on the pre-19th century history, and just say that Newark was founded in 1666; it was incorporated in 1836. Named after Newark, England, it is nine miles west of New York City, and is the county seat of Essex County. Broad and Market Streets were among the original thoroughfares and are still busy with traffic and people. Ten miles of waterfront include the Passaic River and Newark Bay; the lower Passaic River is a superfund site due to the long history of industrial pollution. Among the industries that thrived in Newark were leather-tanning and brewing (tanning and beer do not an appetizing combination make!) The Morris Canal—the bed of which is now mostly filled by train tracks—was completed in 1831, connecting Newark and Phillipsburg (where it connected with other waterways.) For the next four decades, the canal transported ore to Pennsylvania, and coal to New Jersey. The Delaware, Lackawanna and Western Railroad (DL&WRR) moved into New Jersey in 1867, to connect to markets in New York. The canal’s use waned and closed completely in 1923. Important for this story is that the DL&W Railroad was a key connection of Cass Gilbert’s: Samuel Sloan, who was president (and then chairman of the board) of the DL&WRR, and William Truesdale, DL&WRR president after 1899, were associates of Gilbert’s through Howard Carroll. Carroll was vice-president of the Starin Transportation Company, and son-in-law of the president, John Starin. (Starin’s company ran tugboats and lighters.) Carroll was the client for the Gilbert-designed West Street Building in Manhattan, which leased the top floors of that building to the DL&WRR upon its completion in 1907. Gilbert would have been well aware of DL&WRR acquisitions and rebuilding because he was in the business of joining clubs and organizations that included these men, such as the Ohio Society of New York. In Newark, Truesdale added new stations and eliminated grade crossings in the first decade of the 20th century, when Gilbert was obtaining commissions on both sides of the Hudson. (The railroad work divided neighborhoods, as did the construction of the interstate [I-280] later.) These infrastructural changes in Newark paralleled cultural and governmental building projects there: the Essex County Courthouse competition, won by Gilbert, took place in 1901. 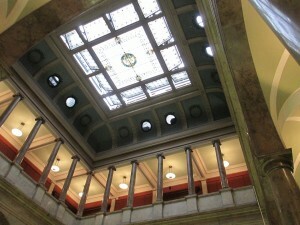 The Newark Public Library (Kellogg and Rankin), the design of which was inspired by Italian Renaissance palazzi (e.g. the Strozzi) and the Boston Public Library, opened in 1901. The polymath, Dr. John Cotton Dana, became the library director in 1902. (Thanks to Linda C. Smith for the link to Dana’s biography.) 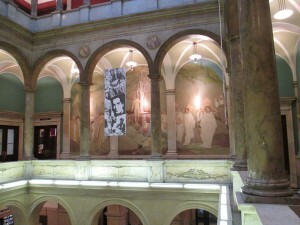 There were several institutions of higher education in Newark; the Newark Museum Association was formed in 1909. Commerce was thriving as well: Tiffany and Co. had plant there, and Newark was one of the great insurance centers, with seven home, fire, and life insurance companies. Prudential was Newark’s insurance leader; in 1903, the company owned the four largest office buildings, each about 11 stories. The 1900 census indicated that Newark had 246,000 people, the sixteenth largest city in the United States; by 1910, the population had increased to 347,469.